PC boards, kits, and assembled units are for sale here! If you are building a tracker, please post in the user forum. I am looking for bug reports, pictures, and information about how the tracker works for you. I will provide technical support to people who are building units. Click here for information about using the Aarlogic GPS 3A GPS module and Telit GC864 GSM module. Caution: I have seen two units with the power transistor installed backward. If you reverse the emitter and collector, the transistor will conduct weakly. The power light comes on, but the device either returns NO DATASTREAM or never replies. With the regulator and transistor installed side by side, and the output of the regulator next to the emitter of the transistor, the flat sides of the two components face in opposite directions. If they are facing the same way, the circuit will not work! I superglued the IC socket and the two rows of three pins for the programming port, then wired those together and installed the rest of the components. Put the 0.1uF capacitor right next to the IC socket. The GPS module is attached to the board with 2-32 size screws, nuts, lock washers, and 1/4 inch spacers, which are not quite long enough. Get 3/8 inch spacers if you mount it this way. When you finish building the project, perform these checks. This will prevent destruction of components and verify that the circuit is built correctly. Check continuity from the negative battery terminal to MCU pin 14, phone jack ground, regulator center pin, and GPS header pin 9. Check continuity from the positive battery terminal to the input pin of the regulator. Check continuity from MCU pin 1 to the output of the regulator. Check for shorts between all adjacent pins of the MCU, programming header, phone jack, and GPS module. There should be no continuity between any adjacent pins. 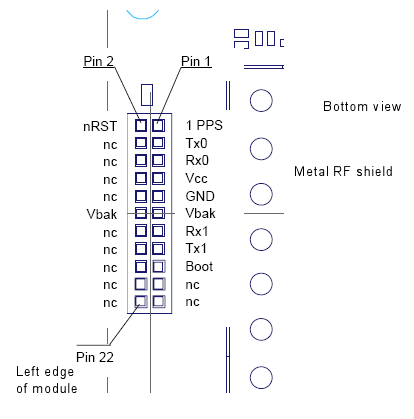 Check continuity from each pin of the programming header to the corresponding MCU pin. Check continuity from each pin of the phone jack to the corresponding MCU pin. Check continuity from pin 3 of the GPS header to pin 11 of the MCU. Place the GPS header over the GPS module and make sure you have wired the right pins. The plug is very small and mistakes here are expensive. All the wires should be on the inside row of pins, closer to the metal shield. No wires should be on the outside row closer to the edge of the GPS module. Measure voltage between pin 1 and pin 14 of the MCU socket. You should have 3.3V with pin 1 positive. 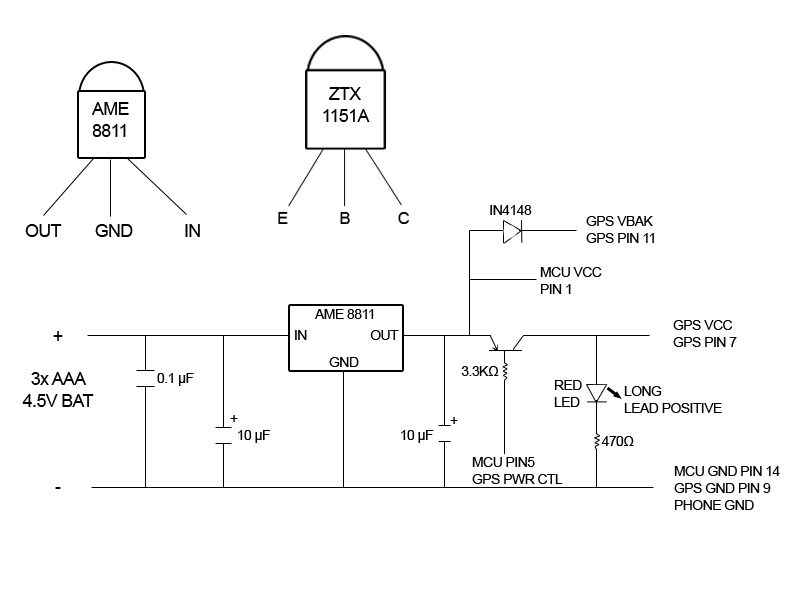 Measure voltage between pins 9 and 11 of the GPS header. You should have close to 3 volts with pin 11 positive. 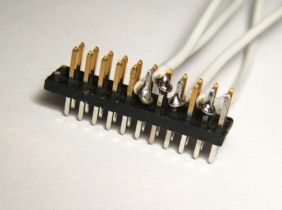 Place a jumper between pins 5 and 14 on the MCU socket. The red "GPS active" LED should light. With the jumper in place, measure voltage between pins 7 and 9 of the GPS header. You should have 3.3V with pin 7 positive. Remove the jumper, and place it between pins 1 and 2 of the MCU socket. Place another jumper between pins 3 and 14 of the MCU socket. The two-color status LED should light red. If it lights green, it is installed backward and all status codes will be reversed in color. The two-color status LED blinks to provide status codes. Status codes are two-digit numbers which assist in debugging. The first digit is always shown in green, and the second digit in red. For example, one green blink followed by three red blinks is code 13. Three green blinks followed by two red blinks is code 32. The status codes are displayed one at a time from a queue, so the event that caused a status code may be over by the time the code is displayed. Remove one battery, install the Atmel MCU, and put the battery back in. 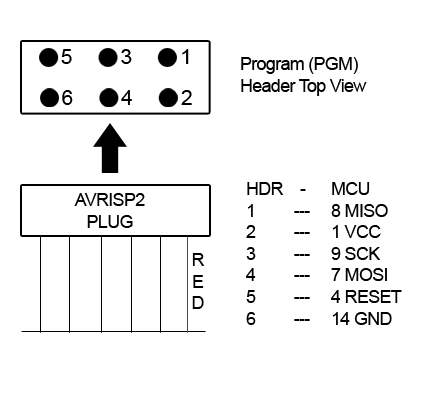 If your MCU is unprogrammed, connect the AVRISP2 to the computer and to the board via the programming header. Both lights in the AVRISP2 should be green. Download the appropriate HEX file for the units (feet, meters, MPH, KPH) you want from the Download link at the top of this page. Run AVR Studio. Choose Tools, Program AVR..., Connect. Choose AVRISP mkII and USB. Click Connect. Choose Board tab and set ISP Freq to 125 kHz. Go back to Program tab. 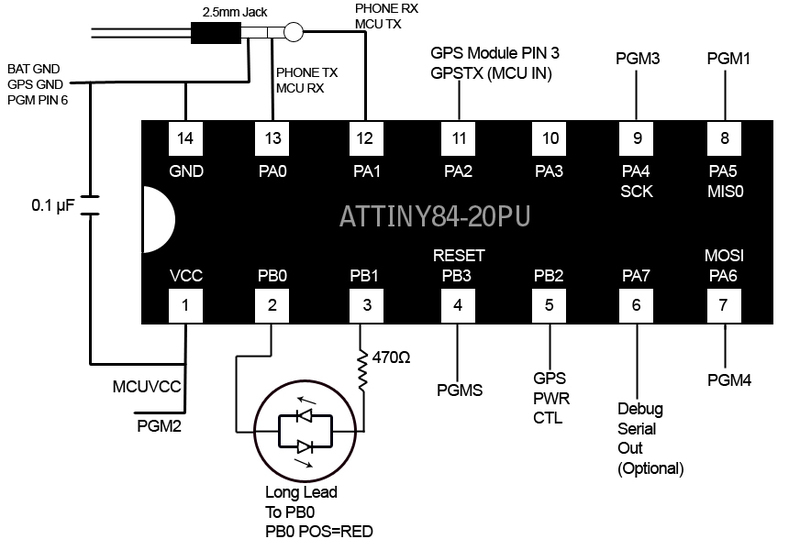 Device should be ATtiny84. Programming mode is ISP. Erase and Verify boxes checked. In Flash, Input Hex File, choose your Hex file. Click Program. The programming status window should show OK. The status LED will begin blinking shortly after the programming completes. With no phone attached, you should get codes 31 (power on or reset), 11 (polling phone), and 13 (phone poll failed.) A freshly programmed chip will also display code 33 (EEPROM initialized) once. Charge the Motorola C168i mobile phone. Install the SIM card and activate the prepaid service using the instructions included. Call the interactive voice response system at 1-800-901-9878 and activate a messaging plan (200 messages for $5.00, keywords: buy features, messaging, 200, yes, buy it) to avoid being charged 15 cents per message. You should be able to send and receive SMS messages from the phone keypad. Set message delivery to Phone first (Message, Options, Memory Meter, Select SMS Memory, Phone First.) If you do not do this, Powersave mode will not work! Remove a battery from the tracker's battery pack. Connect the Vincotech GPS unit to the header, checking against the diagram to make sure it is plugged in correctly. Install the removed GPS battery, and then plug the 2.5mm plug into the mobile phone's headphone jack. The headphone jack is also the data port on this phone. You should get code 11 (polling phone) but no code 13 (poll failed.) If so, your microcontroller is communicating with the phone. If you get code 13, reset the microcontroller by momentarily shorting pins 5 and 6 on the programming header. If you still get code 13, unplug the phone and power cycle it. Removing the GPS battery with the phone connected is not recommended, and will not reset the microcontroller. 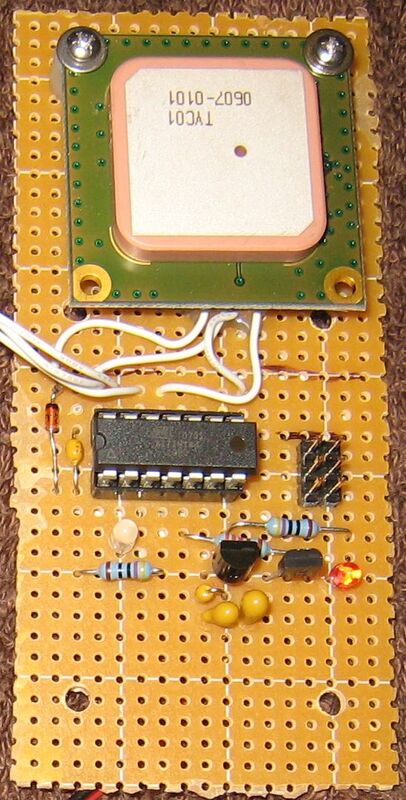 The phone will partially power the microcontroller through the output line and a protection diode in the chip. When you get code 11, and no code 13, your unit is ready for setup. Please post to the user forum. I want to hear about working trackers, and will provide support for anyone having trouble with one. The GPS tracker stores a reply address, and always sends messages to the reply address. It does not care where the messages come from, because messages sent from email do not include the From address (using AT&T GoPhone service.) The reply address can be a mobile phone number or an email address. Regardless of where commands are sent from, replies go to the reply address. where 8185551212 is the mobile number you want tracker messages sent to. The "GPS" must be uppercase. The SETADDRESS can be upper or lower case. After sending the message, the tracker's phone display should light, the tracker status light should blink code 11, and you should receive a reply saying "COMMAND EXECUTED". where "GPS" is in uppercase, 121 is the Email Gateway, and user@domain.com is the email address. For AT&T service, you can send an email to phone-number@txt.att.net (8185551212@txt.att.net) to send a text message. For other carriers, you will have to look up the correct email address. The tracker will reply "COMMAND EXECUTED." LOCATE - the report is the result of a manual locate request. There are other types of reports in tracking mode. If you get a valid location report, your tracker works. If you get "GPS TIMED OUT WAITING FOR FIX" the tracker is not in GPS coverage. Although the A1035 gets a fix inside most buildings, steel construction can block the signal. Take the device outside and try again. If you get "NO DATASTREAM FROM GPS DEVICE" your GPS module is not sending any data to the microcontroller. Check for faulty connections and verify that power is applied to the GPS module when the GPS power LED is lit. Dead GPS batteries can also cause this error, since the microcontroller needs less power than the GPS module. Where "newpass" is the new password you want to set. It must be between three and sixteen characters, and must be repeated twice after SETPASSWORD. You should get back "PASSWORD CHANGED." You would then have to send "newpass LOCATE" to request a locate, for example. If you lose your password, you need physical access to the tracker to clear the configuration (see the command reference.) Messages sent without the correct password will be ignored. So far you have seen the normal mode, in which the tracker replies immediately to requests. The tracker has two other modes: tracking and powersave. In tracking mode, the tracker automatically takes GPS fixes, and sends you a message when it starts moving, when it stops moving, when it goes out of GPS coverage, and periodically while it is moving. You can plot the fixes on Google Maps or a similar service to follow the tracker's movements. You can configure how often the tracker takes a fix and how often it alerts you. You can also set a speed limit and receive an alert if it is exceeded. In powersave mode, the tracker turns the phone power on and off periodically, allowing the phone battery to last longer than its typical standby time. For example, the phone may be off for an hour and on for ten minutes. In this case, it can take up to an hour for the tracker to reply to messages. You can remotely take the tracker out of powersave mode when you need location reports. Tracking and powersave modes are mutually exclusive; setting one mode clears the other. The tracker has several configurable options, and a status command that reports the current settings, the phone battery status, the phone signal strength, and the firmware revision. You can set a name which will be prefixed to all tracker replies, so several trackers can report to the same destination. See the command reference for details.